Depending on the necessary functionality the amplifier by Jenaer Antriebstechnik (Germany) can control up to eight axes and measures 145 mm x 72 mm x 214 mm. 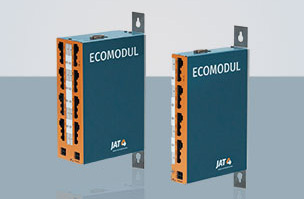 The modular design facilitates the adaptation of the device to different applications. The equipment costs are clearly reduced, and the amplifier including customer-specific equipment is available for the mechanical engineer significantly faster, said the company. The servo amplifiers support the following interfaces for setpoint setting (depending on series and type, cf. detailed description): CANopen, Ethercat, Profibus, Profinet, EIA-485, EIA-232, or analog input. The CANopen interface conforms to CiA 301 and CiA 402. Interpolation is enabled via CANopen. The product comes with a power supply of 24 VDC to 60 VDC, a rated output current of 4 A, two digital inputs, one analog input, and one holding brake input. STO (safe torque off) functionality and a USB parameterization interface are also provided. Optionally, additional digital in and outputs as well as an external encoder are also available. The CiA 402-compliant servo amplifier features torque, force, velocity, and positioning control.